It is mandated by the Food and Drug Administration that all perishable foods have a comprehensive expiration date incorporated on the label of the product. This includes spiral sliced ham. Spiral ham is a precooked or smoked product, which helps the longevity of its shelf life and only requires a reheating process to be consumed. However, because it is presliced, which compromises the shelf life of any meat product, it should be used or frozen by its expiration date. Although spoilage may be minimal, expiration dates are used on such products as spiral ham to ensure quality and reliability of the meat. 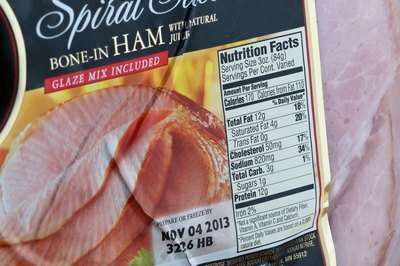 Most spiral hams have a seven-to-10 day "use by" date on the expiration date label. Spiral ham should be refrigerated regardless of being cooked or smoked first. Wrapping the meat in extra airtight sealant may aide in savoring the flavor of the ham, it will do nothing to elongate its shelf life. Freezing the ham is an option for longer storage periods, but keep in mind that freezing will create ice crystals that will add more moisture to the meat than is necessary. After time, this can also deteriorate the texture and molecular structure of the meat. One to two months of freezer storage in an airtight storage bag is recommended, but two to three months would most likely still produce an acceptable ham dinner. Even after a spiral ham is prepared for a meal, it will only last in the refrigerator so long before its shelf life is compromised. Ham will dry out if not wrapped properly or can build up moisture in the packaging if wrapped while still warm. After cooking the spiral cut ham, allow the meat to cool down to room temperature before wrapping. Wrap tightly in an air-tight container or bag and label it clearly with a four-day expiration date. After that, the quality, freshness and safety of the meat is questionable. You can store prosciutto in chunks or slices in the refrigerator or freezer, for same-day consumption or up to three months. later.